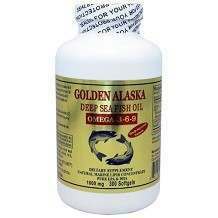 Golden Alaska Deep Sea Fish Oil is a good source of unsaturated fatty acids and delivers rich OMEGA-3 fatty acids, (Pure EPA 180mg/DHA 120mg). Great Sea Alaska Deep Sea Fish Oil is manufactured from natural marine lipid concentrate and may aid to lower or prevent certain risk factors associated with heart disease, and inflammatory and immune disorders. Using Golden Alaska Deep Sea Fish Oil on a long term basis could even assist in stopping menopausal symptoms, encourage healthier blood circulation, lowering bad cholesterol, stop blood clots from forming and lessen heart problems, as well as easing the aches and pains brought on by arthritis. Omega-3 and polyunsaturated fatty acids which are found naturally in fish and golden Alaska deep sea fish oil assist in protecting the body against heart and blood vessel ailments. Additional Omega-3 Fatty Acids – 100 mg.
As per the suggested dosage, adults are advised to take two softgels on a daily basis. It must however be remembered, that before using a supplement, a doctor should be consulted. $112.00 is the price for a four month supply and when opting for this pricing structure, buyers will enjoy the benefits of Golden Alaska Deep See Fish Oil Omega for just $28.00 per bottle. When making a purchase, the suppliers offers a 90 day risk free guarantee. This means that if buyers are not 100% satisfied, empty containers can be returned within 90 days and a complete refund will be paid. The refund, however is not inclusive of shipping charges. 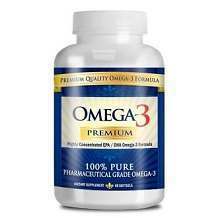 The daily Omega-3 supplement is not costly and in addition, when ordering, a doctor’s prescription is not mandatory. This, coupled with the affordable prices means that those interested in purchasing the high potency, 100% pure supplements will not be taking a great risk when ordering. Furthermore, due to the fact that the vender offers a risk free trial for 90 days, it’s a must for those who are serious about improving their well-being and serious about supplements that deliver effectives results.